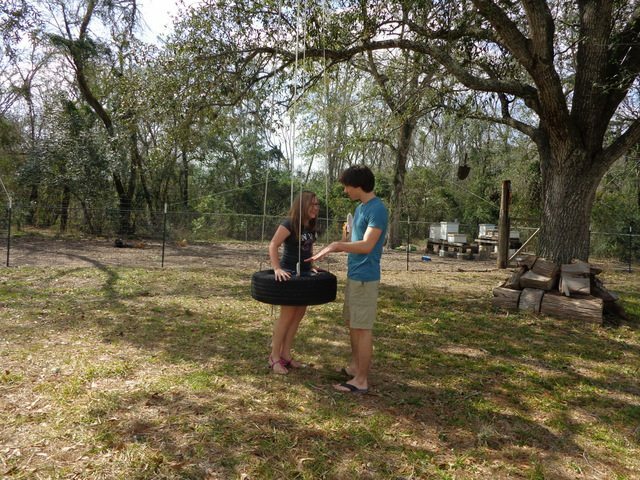 All you need is a tire, sharp knife, strong rope (we used mule tape – but will be changing to rope), 2″-3″ in diameter branch, two 2′ pieces of old garden hose, tall tree with strong branches. Pardon Esther, she just can’t help herself when there’s a camera involved. Using your sharp knife (Carl used his pocketknife) cut 4 X’s on one side of the tire. Try to make them about the same distance apart. 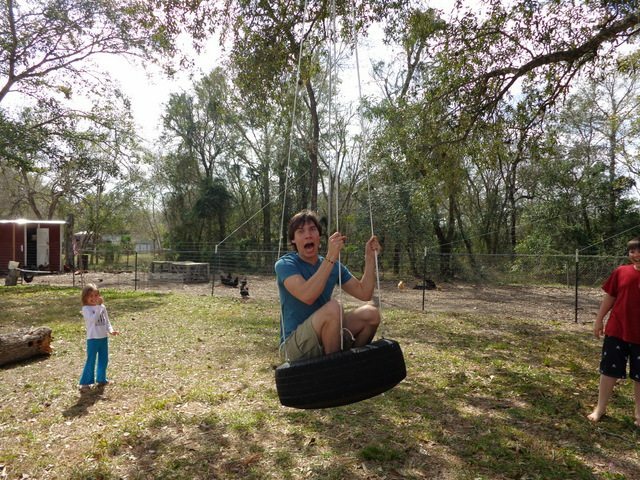 Put your rope through one hole and attach one of the small branches to it. 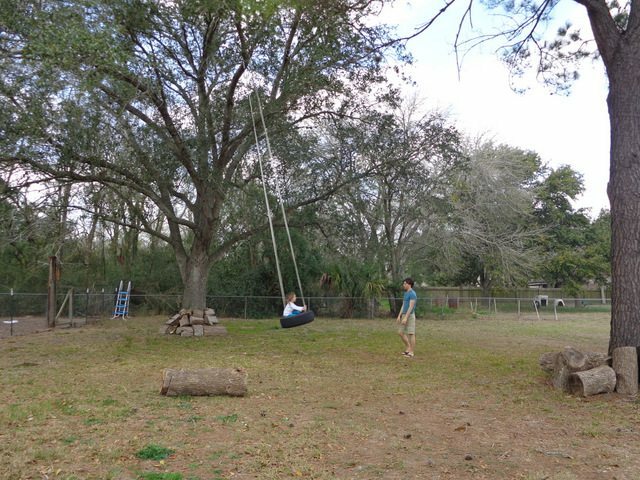 Then, string the rope through one of the garden hoses, this is what is actually going to be touching the tree branch to protect the rope. Go ahead and get it up on the branch where you want it to get the lengths right. put the rope through one of the holes next to the first one. Now, pull the rope up through the next hole. 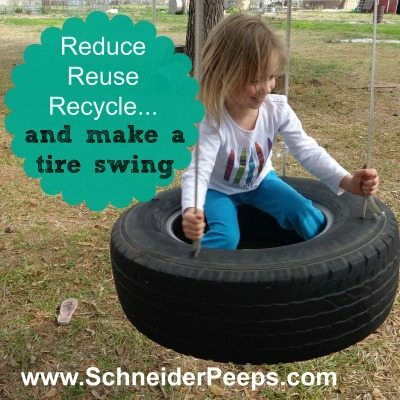 Run it through the other piece of garden hose, up over the tree branch and down to the last hole. 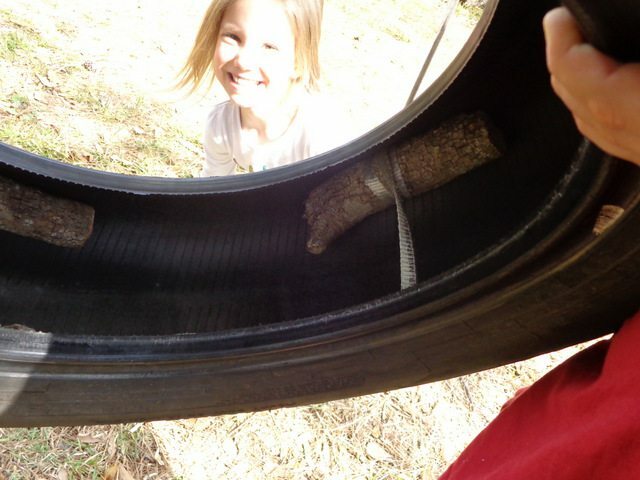 Pull the rope through the last hole and secure a branch like you did in the first hole. This post is shared at Barn Hop, Mostly Handmade Mondays, Backyard Farming Connection, Tuesday Greens, Maple Hill Hop, Homemaking Blog hop, Mountian Woman Rendezvous, What We Learned Wednesday, Family Friday Summer Fun Link up. 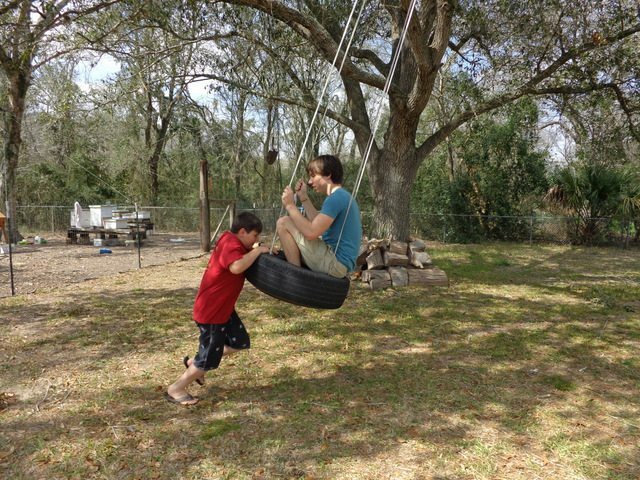 I love the swing. In the background I see your bee hives in your chicken run. May I ask, what are the wires (or string?) going from the T posts up into the trees? Your bee hives are sitting up on some kind of stand and have something around the “legs” of the stands including the top bar. What is that and why? Is there a reason you decided to share space? I tried to get a swarm to live in my top bar hive with no luck. How did you prepare your top bar for the bees? In relation to the langsdorf hives, how do you like the top bar? Thank you for answering my questions. I do love your blog. Thank you for all the information. I LOVE IT! I would love to see closer photos of the beehives (if you have the time) I am always trying to make my apiary a better place for my ladies. Have you clicked on the bees photo in the side bar. All of our bees posts are there. There’s a few closer pictures in some of the posts. I should write more about the bees but it’s hard for me since I’m not the beekeeper. I’ll be doing an update post soon and I’ll address some of your questions there, too. Thanks! Thank You. I did. I am excited to spend more time reading this evening. I do love your blog. 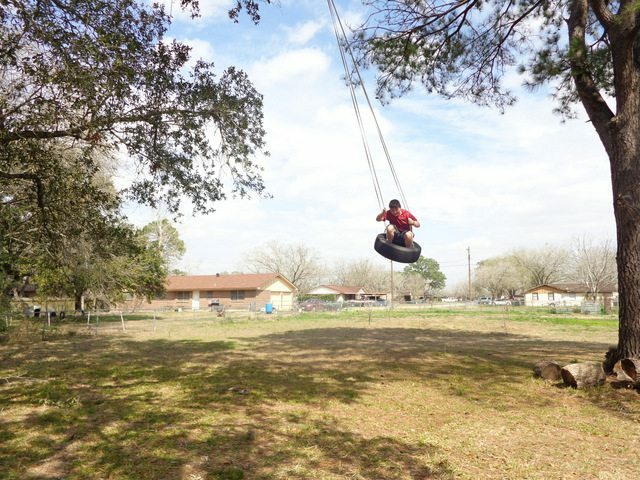 some of my best childhood memories are on a tire swing! 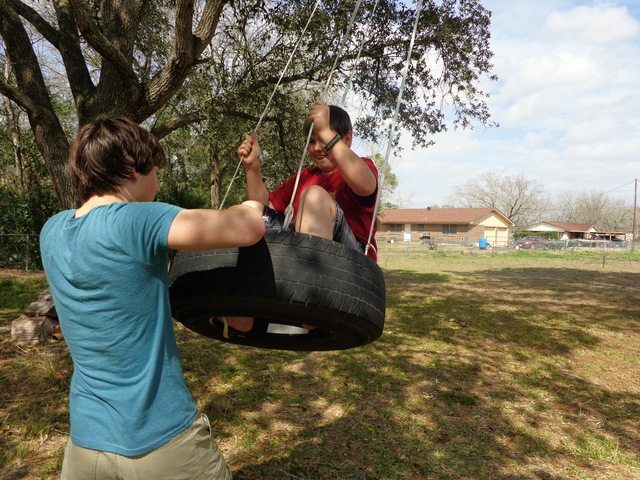 the simplest things can be so much fun! your kids look like they had a blast! 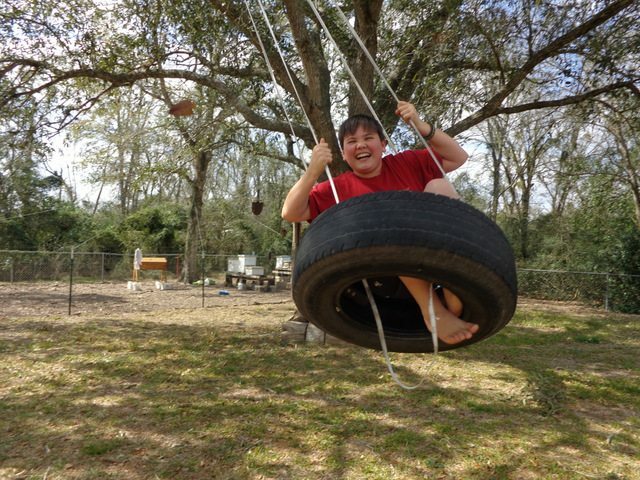 I think every kids should have a tire swing. Wow, this is great! Now I’m not going to fret so much next time we need new tires! 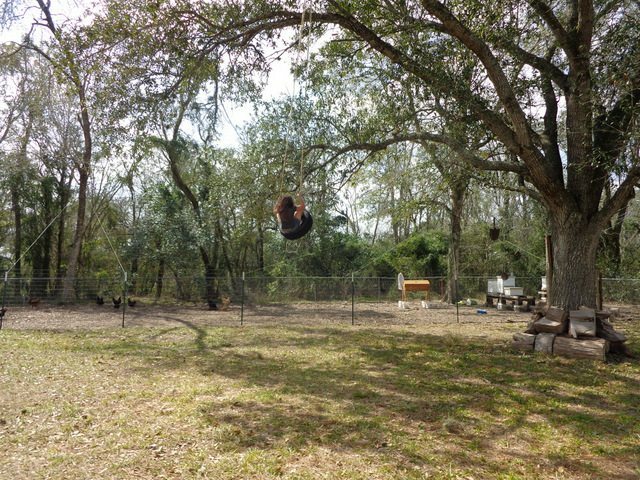 How in the world did you get the swing strung up so high, though? lol…our 17year old climbed the tree. Good thing I wasn’t here at the time. But, the one we had in our last house wasn’t that high. Just find a strong branch and it will be fine.